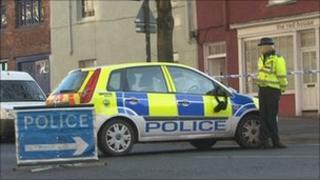 Four people have been arrested on suspicion of murder after a man was found dead in Bristol city centre. Avon and Somerset Police officers were called to a flat on Frogmore Street at 0750 GMT on Sunday. A force spokesman said two men aged 27 and 34 and a 29-year-old woman were arrested. A fourth man, aged 40, was arrested later. The spokesman said the victim, a 31-year-old from Poland, had suffered serious head and facial injuries.